Putting people at the heart of our businesses' success, and more simply at the heart each person's success! Here in Anjou, entrepreneurs care about individual well-being, and want to give their lives and businesses a sense of meaning. Stakeholders in the Maine-et-Loire's local economy celebrated the things that matter most at three meaningful events! 3 remarkable events with a strong message, focusing on people, aspiration and enjoyment! Prestige evening at the château in Brissac-Quincé. 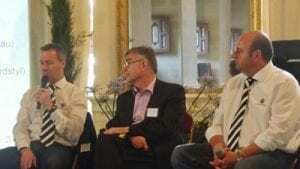 On 5 June 2015 the Loire Aubance Enterprise Club (CELA) and its partners (see list here) organised a conference on "How to grow your business". Three speakers - Ludovic Misandeau (Misandeau), Jean François Dutour (Placardstyl), Dominique Desjeux (Daize&co) - explained in simple terms what they do to help their businesses grow. 150 business leaders, councillors and names from the local economy came along to take part in interesting discussions and share their thoughts in a stunning setting - the chateau in Brissac-Quincé! The evening was hosted by Alexis Desjeux, chairman of the CELA, an active entrepreneur in the region, and member of Produit en Anjou. Various points were addressed, stemming from key concepts "I think there are 3 things you need to focus on to take your business to the next level" explained Alexis Desjeux; "being aware of others: listening to what your co-workers have to say and help them to progress. Working hand in hand with each other so that each person can flourish. Finding synergy and balance with your home life. You also have to have a sense of purpose: you need a goal, a dream, to move towards. Purpose gives you the impetus to advance. And lastly, you need to cultivate your values: helping others, creativity and audacity. Be prepared to take risks to progress. Have the courage to stand up for your ideas." Are you involved in local networks and what do you get out of them? All 3 speakers confirmed that technology will never replace human contact when it comes to building trusting and lasting relationships. For Ludovic Misandeau "you can't fight nature; to build a network, you have to be yourself and have the human touch, whatever type of network it is. "Jean François Dutour adds"I founded the Club des 100 Cravates with other business leaders, which Ludovic is also a member of, and it works because we all share the same interest, football. Business isn't the priority, it crops up naturally as we chat and get to know each other. It's also important to have a good work-life balance, and that's achieved by thinking ahead, talking to your spouse, and including your employees in things. "Dominique Desjeux, who has lectured at the Sorbonne for over 20 years, says "I set up my network with and for students, to prepare them for finding a job in a national or international company. As a result of my network, I now set up multidisciplinary teams to take part in surveys for big companies such as Kellogg's, L'Oréal or La Française des Jeux, throughout the world. (Sociology and ethnic marketing)". Ludovic Misandeau outlined the importance of continuing professional development for himself and his teams, to develop each person's competencies and enhance the skill set of all employees and the boss. "I'm a wood craftsman, I trained myself up to become a business owner and manager. I also spent time with my peers, other business owners, to learn from their experience and share my own." Jean Francois Dutour wrapped up with "I believe it's essential to involve teams and make them accountable within the business. I work with a network of retailers and we constantly have to keep progressing and find new solutions for training and trade shows, and informal discussions help us grow together and improve our processes." Sole trader Dominique Desjeux is active on all fronts: "I find clients at conferences, through talking to people I meet at conferences or seminars, or over a good meal (Chinese, Korean or American) in a friendly but professional context. All these occasions are an opportunity to get to know people and make contacts. But I also make contacts through books or articles I publish, or from spots I do in the media (radio/TV/press). I often handle the production with a team of experts, who are my past students, and coordinate the projects. To make sure I get orders and new clients coming in, I overwork, as do many sole traders I imagine. I have the advantage of working at home in Paris, and I married a great coach who supports me immensely". Alexis concluded: "We can say that networks, sales and new technologies are complementary. The main thing is connecting with others, getting yourself and your employees involved, and having a work-life balance, to achieve personal harmony. You also need to keep an open mind and reassess yourself every day in order to anticipate the future." CEA Prestige evening at Le Quai theatre in Angers on 2 June 2015. Eric Martin, president of the CEA (Club Entreprise de l'Anjou), and volunteers from the group organised an evening with meaning on the topic of "From audacity to success", with a debate led by Cécile Lefort and 3 reputed speakers: Philippe Crozon, famous for his sporting exploits including swimming to 5 continents despite having had 4 limbs amputated; Guy-Richard Cloutier, a chartered accounted and entrepreneur from Quebec; and comedian Olivia Moore. They all told their stories to show how willpower and determination can turn obstacles into opportunities. The consensus was that "personal well-being and collective success depend on people! The strength of a business lies in motivation, willingness, sharing and a desire to grow together (on the same scale as our goals and dreams) so we can share our experiences and similitudes with others and build our lives around our dreams." The debate was followed by a cocktail and upbeat, live shows in the lobby of Le Quai theatre in Angers. It was a great success, attracting over 600 local business leaders. The Harmonie Mutuelle Prestige evening got the ball rolling at the end of May with "self-ecology, the key to sustainable management". A fabulous evening held in the prestigious Le Quai hall in Angers, hosted by Anne-Sophie Rostaing & Valérie Audureau, expert consultants in helping individuals and/or teams achieve quality of life in the workplace with the Edifia group. The message was simple but true: be happy with yourself to be in harmony with others! Save your energy and be calmer and more relaxed on a daily basis to enjoy more balanced relationships in your everyday home and work life. The conference helped us to understand more about stress and tension. We did a few practical relaxation exercises like body relaxation (Brain Gym). A worthwhile and meaningful experience for avoiding burn out! Share the post "Prestige evening"